Well, the Bulls’ next week is looking like it may have some cracks in it as well. The starting lineup changes with the news that shooting guard Jimmy Butler is out “week-to-week” with a turf toe injury. Butler did not accompany the team for the Western Conference road trip which begins Thursday in Denver, in effect, his road not taken. “It seems likely, at least playing Denver, and probably beyond, that Kirk Hinrich moves into starting spot,” writes Smith. The Bulls, in more versus than verse, though, face four games in five days. Then they continue on to Detroit before returning early Thanksgiving morning for a brief holiday stopover and then to Cleveland to finish the trip Nov. 30. It seems like Butler will be out those games. So who takes his place? It seems likely, at least playing Denver, and probably beyond, that Kirk Hinrich moves into starting spot. The Nuggets play multiple small guards, so a Rose/Hinrich backcourt should not be an issue against Denver. 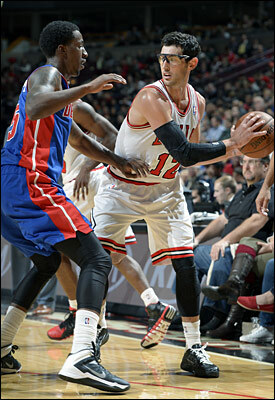 Rose and Hinrich have had success in the Bulls current five-game winning streak playing together at times. So there also should not be much adjustment period. Bulls coach Tom Thibodeau said he has not made a decision and it’s possible Mike Dunleavy could start as Thibodeau likes to bring in Hinrich for Rose and doesn’t want to play Rose too much. Butler’s injury is unfortunate for he and the team as he just had his most productive quarter of the season before he was hurt Monday against Charlotte. Plus, the Bulls have essentially been using an eight-player rotation with Nazr Mohammed getting occasional minutes. So Hinrich’s or Dunleavy’s move to the starting lineup puts pressure on the bench. It seems a possible situation as well to use rookie Tony Snell at least in limited minutes in a rotation spot given Snell can play guard or small forward. Thibodeau historically has been slow to employ both new and rookie players, but does so with injuries as he did with Omer Asik and last season with Butler. There also could be some opportunities for Marquis Teague to play. Though Hinrich has played well with Rose giving the Bulls a dimension they don’t have with Butler as both can run offense and make plays off pick and roll, the Bulls are committed to being cautious with Hinrich’s playing time as well. Thus the complications. Last season when Hinrich had to start and play big minutes with Rose out, Hinrich had injury issues and missed games. The Bulls are hoping to avoid that. Because the Bulls are a versatile team there are various lineup options they could employ. Luol Deng has defended shooting guards in the past. Thus the Bulls could offer a lineup with Dunleavy at shooting guard or small forward. They also could use Taj Gibson as small forward since Gibson often us used late in games to switch pick and rolls and play guards and small forwards in the Bulls defense. Though that compromises the offense as Gibson does not have shooting range, and, in fact, has been one of the Bulls better post up scorers this season. One lineup I’ve been interested to see is Mike Dunleavy taking a spin at the stretch four spot. The Bulls have had spacing issues this season as defenses collapse on Rose and their three-point shooting hasn’t been good. 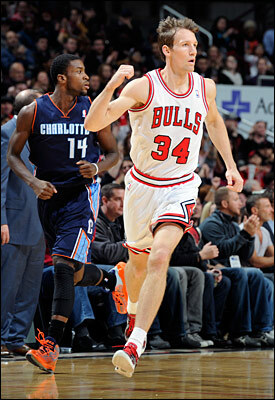 It’s improved of late, and it was a Deng three that effectively saved the Charlotte game Monday to get the Bulls to 6-3. Rose earlier made six three pointers against the Pacers. Dunleavy after a slow start in which he wasn’t getting many shots has climbed into the top 10 in the NBA in three-point shooting percentage. So there could be possibilities with Dunleavy at power forward along with perhaps Deng at small forward and Hinrich at shooting guard. That group with Rose could spread the floor the best for the Bulls and give Joakim Noah chance to roll toward the basket. I’d also like to see some of the so called one/four flat offense where Rose is isolated with no screener. The Spurs use plays like that with Tony Parker. It enables the quick point guard to get inside for a better run at the basket or pitch out to shooters and swing the ball to open the court more. With Dunleavy, Deng and Hinrich on the perimeter it potentially gives the Bulls more shooting options. The Bulls are heading into a stretch of games against high scoring teams. And while their defense is their strength, it’s often not enough to hold off great scoring and shooting teams. Dunleavy after a slow start in which he wasn’t getting many shots has climbed into the top 10 in the NBA in three-point shooting percentage. That defensive philosophy and commitment will be tested on this trip as the Bulls open with three in four nights against three of the highest scoring and most potent offenses in the league, and in places where even high level Bulls teams in recent years have been unable to win. It’s why this trip sets up as one that would look good with a .500 record. Often the road to success, like the Bulls, is under construction. The Nuggets, though without the injured JaVale McGee, are again a high scoring, fast paced team. But of the first three teams the Bulls face, the Nuggets are the least offensive. The Trail Blazers on the second of the back to back Friday have been the league’s hottest team and then the early game Sunday in Los Angeles against the Clippers presents the league’s highest scoring team. It’s one thing to play a defensive style against defensive oriented, half court Eastern teams like the Pacers, Bobcats and Cavaliers. But it’s much different to try to keep pace with the offensive options from teams like the Clippers. Here’s a look at the opponents on the six-game trip. — Denver, Thursday Nov. 21. The Bulls left early Wednesday so they could practice in the Denver high altitude. They’ve done it before and it doesn’t do that much good. This would be a game to go deeper into the rotation with a back to back. The Bulls have lost their last six in Denver and 11 of 13. Though the Nuggets are off to a slow start, they are improving their running game with new coach Brian Shaw and had the Thunder beaten in Oklahoma City earlier this week until a late collapse. They often play small with bruising Kenneth Faried and J.J. Hickson inside and former DePaul player Wilson Chandler back from injury. There’s also former Bull Nate Robinson, listed day to day with a wrist injury that had Robinson shooting left handed in practice this week. Given it’s the Bulls and who he is, it seems likely Robinson will play. — Portland, Friday, Nov. 22. They’re the hottest and most overlooked early, best team after winning in Brooklyn Monday and Milwaukee Wednesday. Even when they’ve had troubles, the Bulls have found Portland their Achilles with five straight losses and 12 of the last 13 there. The Trail Blazers are in the top 10 in the league in shooting, scoring and rebounding and fourth in threes. LaMarcus Aldridge is having a career year helped by the physical presence inside of Robin Lopez. Damian Lillard is among the best point guards and Mo Williams gives them scoring off the bench in a high octane game. — Clippers, Sunday Nov. 24. It’s an early, 12:30 p.m.local time start (2:30 p.m. CT) against a team that never stops running and shooting. Chris Paul leads the league in assists and has shooters around him in J.J. Redick, Jared Dudley and Jamal Crawford, and Blake Griffin is getting to the rim and was recently named player of the week in the Western Conference. They’re scoring at a staggering rate for this era, though they give up a lot of points. They’ll continue to push and this is a game you’ll have to keep up with them. The Clippers have improved in recent years and the Bulls have lost eight of the last 13 to them in Los Angeles. This also is a third in four days and an unusually early start that makes the travel even more vexing with Butler, who is a big minutes player, not on the trip. Coming out of these three with one win would be a good start to the trip. As Jack Kerouac wrote in “On the Road,” L.A. is the loneliest and most brutal of American cities. The Clippers, too? — Jazz, Monday Nov. 25. It’s the break in the schedule, though making it a tough game as the fourth game in five nights in a difficult place to play, Salt Lake City. The Bulls have lost 11 of 16 there, though obviously to better Jazz teams than this one, which is at the bottom of the league. The Bulls beat them in Chicago Nov. 8 after the Bulls 1-3 start. Which makes this sort of a must win game. There won’t be an opponent this weak on the trip. They have rookie point guard Trey Burke back after a preseason injury. He’s missed with a team with no point guard. But it’s a young group with Enes Kanter, Derrick Favors and Gordon Hayward and plenty of early confusion. — Detroit, Wednesday Nov. 27. This game closes the first portion of the trip as the Bulls travel back to Chicago after the game to have Thanksgiving Day at home and then off to Cleveland on Friday. The Pistons are a wild, but improving team with a chance to make the playoffs just coming off a home win over the Knicks. They have a talented front line in athletic center Andre Drummond, Greg Monroe and Josh Smith. They’ve sat down declining Chauncey Bullups with rookie Kentavious Caldwell-Pope giving them outside shooting. Point guard Brandon Jennings shoots too much and loves to get in macho duels with Derrick Rose, which makes the game unpredictable. The Bulls have had dominance in Detroit, but this is the best lineup they’ve had since the conference finals teams. — Cleveland, Saturday Nov. 30. The Bulls defeated them at home Nov. 11 in shutting down Kyrie Irving in Andrew Bynum’s first start. Since then they’ve had a supposedly raucous team meeting amidst rumors and speculation that there may even have been a fight after Irving showed up for the next game with a black eye. Focus has been on Dion Waiters, who had missed practice, but insisted he really was sick and it’s all media inaccuracy. The team says it’s all media fantasy. In any case, it’s an unsettled team with Mike Brown back coaching and meeting resistance with his stolid game style and the owner holding a playoff-or-best mandate over the team. Still, they are dangerous with Irving and size up front as the Bulls wrap up 12 days since their last home game.